There are many activities at MITRE that fall within the realm of Context-Aware Mobile and Pervasive Data Management. This position paper discusses several of these activities, but is not meant to be an all-encompassing view of MITRE’s activities in this area. The first activity discussed is the Ground Moving Target Indicator (GMTI) Virtual Warehousing research. An ever-increasing amount of information is becoming available about moving targets on the ground in the theater of operation. Joint Surveillance Target Attack Radar System (JSTARS) and Unmanned Aeronautical Vehicles (UAVs) are current providers of GMTI, correlated tracks, and Synthetic Aperture Radar (SAR) imagery. Additional UAV sensors will soon be operational and will provide more information. Several allied nations are acquiring similar systems and will become both producers of allied GMTI information and consumers of our GMTI information. This wealth of information needs to be managed and made accessible to the many consumers who will benefit from it. 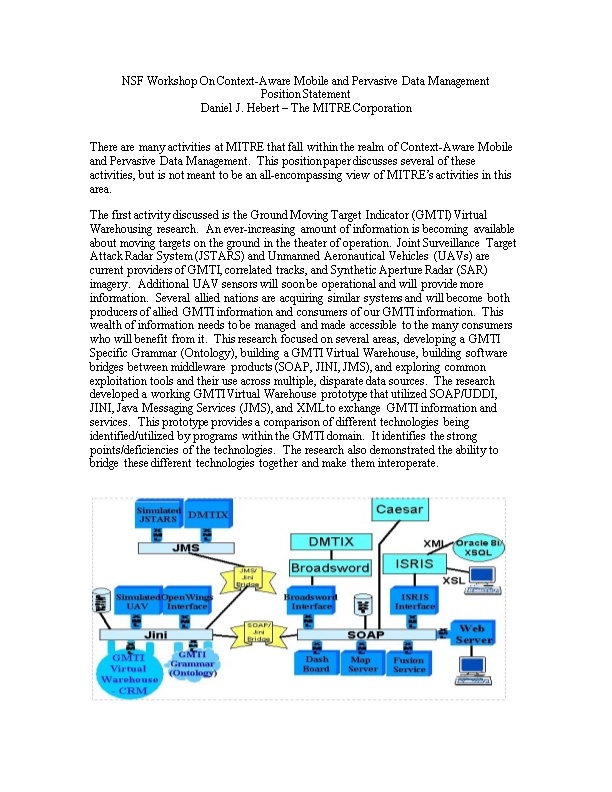 This research focused on several areas, developing a GMTI Specific Grammar (Ontology), building a GMTI Virtual Warehouse, building software bridges between middleware products (SOAP, JINI, JMS), and exploring common exploitation tools and their use across multiple, disparate data sources. The research developed a working GMTI Virtual Warehouse prototype thatutilized SOAP/UDDI, JINI, Java Messaging Services (JMS), and XML to exchange GMTI information and services. This prototype provides a comparison of different technologies being identified/utilized by programs within the GMTI domain. It identifies the strong points/deficiencies of the technologies. The research also demonstrated the ability to bridge these different technologies together and make them interoperate. The second activity discussed is the Joint Battlespace Infosphere (JBI) initiative. 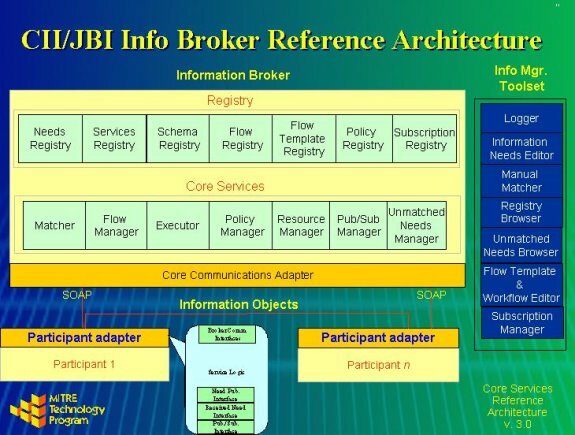 The JBI is an enabling architecture framework that provides a loosely coupled information exchange layer for providers and consumers. JBI Core Services provides mechanism to publish, subscribe, transform, query, and control information exchange. The goal of JBI is to provide the right information to the right people at the right time. Participants in the JBI framework advertise of services and needs. JBI does the work to connect publishers of information with subscribers. It makes access to information much more dynamic and robust. Participants can collaborate and function within dynamically changing business processes. Based on internet standards, JBI can provide a flexible, open architecture to integrate information across multiple domains. Information exchanges can be described, published, discovered, and invoked dynamically in a distributed computing environment. MITRE conducted an initial Wright Flyer JBI (wfJBI) research effort that uncovered many potential benefits as well as limitations of the JBI vision. A follow-on effort called the Next Generation JBI (ngJBI) is on-going. It will leverage in-house and commercial products to develop a more mature and capable information architecture layer. The third activity is a new piece of research that we are just starting titled “Information Management of Sensor Webs”. There is a large amount of interest and activity centered on the linking of multiple sensors together into a “sensor web”. This interest is widespread throughout industry, academia, and the government. We are already seeing significant computing power and storage capability at the sensor that allows some aggregation and fusion of the raw sensor data to be accomplished. As the amount of computing power and storage space continues to increase, we are seeing the need for the sensors to become “context-aware” to further enable the ability to fuse and aggregate. The individual sensors will need additional data from other sensors and other systems to provide them with the needed context. This need brings a much larger information management problem, as data and information will have to be better managed to meet the needs of the “sensor web”. Sensor web is about millions of sensors connected together in an ad-hoc manner and collaborating with each other to gather sensor data, fuse the data, correlate the data and take actions. Sensor data management provides techniques for effective management of sensor data. For many applications in domains such as process control, intelligence and command and control it is critical that sensor data be processed in a timely manner. For example, SIGINT data processing is an important part of managing Intelligence data. For command and control systems such as AWACS (airborne warning and control system), sensors gather data about the tracks, correlate the data and process the data within a certain time. The next generation of sensor computing deals with sensor webs where the sensors are autonomous and yet have to cooperate with one other. This research will investigate characteristics of sensor web and explore architectures and data/information management issues for the sensor web. The architectures include those based on components, frameworks and distributed objects. Data management issues include data models for sensor data, techniques for managing data streams, techniques for query management, optimization, storage management and caching, as well as extracting and managing metadata from the sensor data. Since the sensors essentially form a web, we need common data representation schemes. One approach is to examine XML-like languages for common sensor data representation. We also need to examine the use of RDF-like languages for incorporating semantics. Data mining and knowledge discovery techniques are needed for mining sensor data and extracting patterns often previously unknown. For example, one may extract information about adversaries (their locations, plans and actions) by mining the sensor data. We need to augment data mining with decision support techniques to support the analyst to make effective decisions. One may ask the question what is the difference between the sensor web and the semantic web? According to Berners Lee et al, the semantic web is about machine understandable web pages. Various data, information and agent technologies are being examined for understanding the web pages and making effective decisions. Sensor web is somewhat similar except that we are dealing with sensor data. That is, the sensor data has to be processed, managed and understood by the machines.